Cooking for friends and family is one of life's many pleasures and in my eyes there is nothing better than seeing people enjoy food you have taken time and attention to prepare. But it has a time and a place. And so does Chinese takeaway. I struggle to think of anyone I know who doesn't enjoy the odd Chinese indulgence at the weekend. There are excellent Chinese restaurant dishes like Cantonese Roast Duck, Salt and Chilli Squid and Steamed Scallops with blackbean, dishes which perhaps wouldn't travel too well. But in the takeaway world there is one dish which is head and shoulders above all-Curry! I'm not going to bore you about its origins or why Chinese takeaways have adopted it or even how it isn't even Chinese. It tastes great with everything from chips to rice and noodles made with chicken, beef, pork or prawns. But before you pick up the phone to the local delivery this version will be quicker, tastier and healthier than the takeaway version. 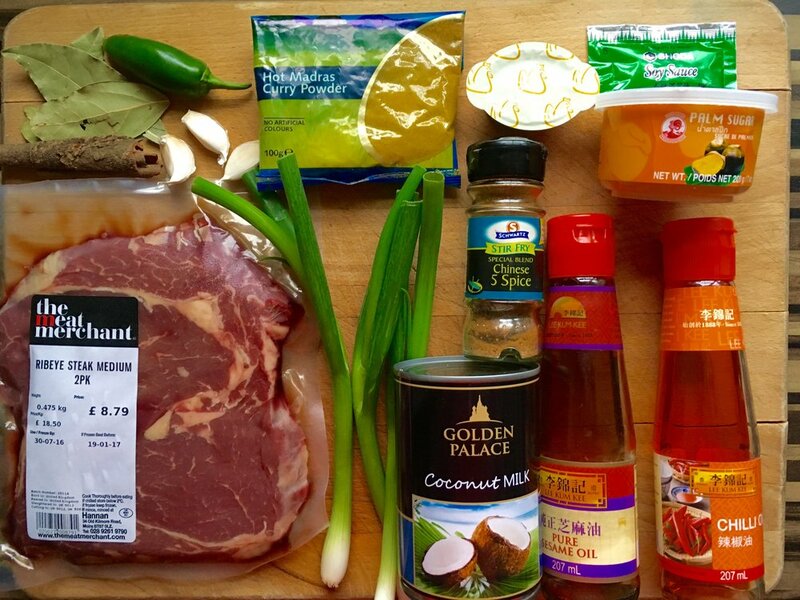 It will most certainly be one of the easiest dishes to make on Swankfood. It probably isn't cheaper though as I opted for the tastiest cut of beef in rib eye, this is Swankfood after all, but as previously mentioned you can use what ever meat you desire. Rump steak would be a decent cheaper alternative. Start by cutting the beef into strips and put your wok on high heat. Add a small amount of oil and wait for it to smoke then add half of the beef. Stir fry for 1 minute and remove. Add the second batch of meat and repeat. 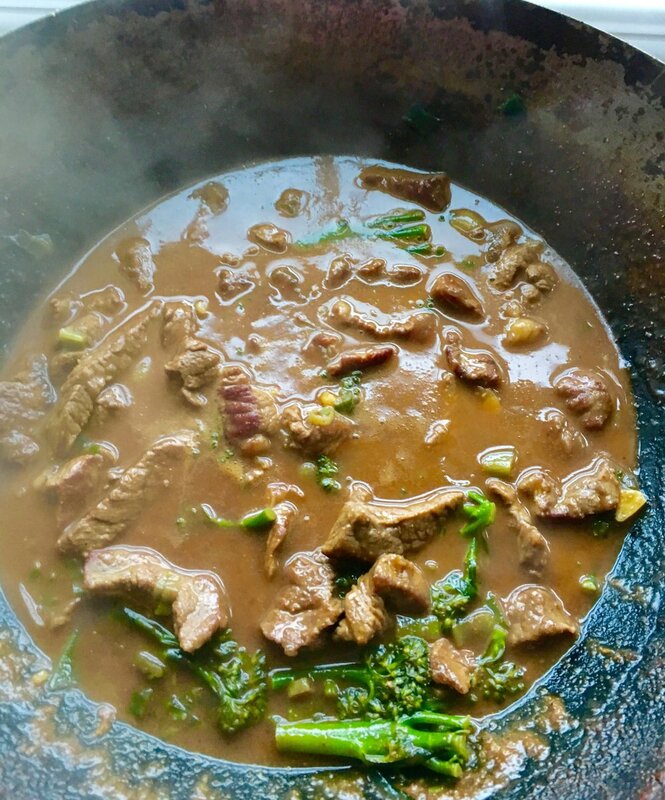 If you add all the meat at once the heat will quickly drop from the wok and the beef will stew rather than fry. After 1 minute re add the first batch back to the wok then add the curry powder, garlic and five spice. 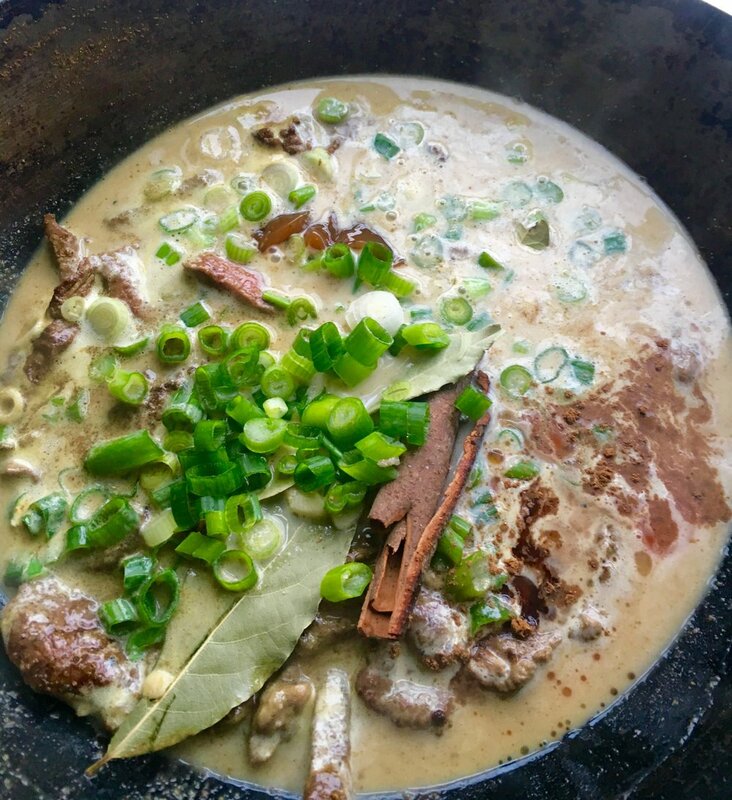 Stir for 30 seconds for the spices to release their flavour then add the coconut milk, soy sauce, bay leaves, cinnamon, spring onion, sesame and chilli oils, stockpot and palm sugar. I also included some tender stem broccoli at this point. Let the ingredients simmer and reduce for around 5 minutes then remove the cinnamon stick. Continue to simmer for a further 10 minutes until it reaches a thick and creamy consistency. Serve with rice, noodles or chips and for effect garnish with sesame seeds and fresh chilli although completely unnecessary.